Fjällräven’s Abisko/Nikka trouser is made from G1000, a polyester cotton mix that can be made more water-resistant by applying Greenland Wax and then ironing. So for example you can proof the seat, front of thighs and lower legs while keeping other areas more breathable for extra comfort. It is this unique feature that sets them apart from other trousers and makes them particularly suitable for hillwalking and backpacking, as it allows them to provide a performance somewhere between a normal trouser and a soft shell or other water-resistant trouser. The fit is very good as it’s well-shaped, but in addition the leg length is left long so you can adjust it to suit, which means these will more easily fit those with longer legs. There are stretch panels, reinforced areas and a diamond crotch panel that improves the comfort and fit further. The waist area is plainer than others, though, with no additional lining and no stretch, but you do get belt loops. Pocketing is very good with an OS map-sized thigh pocket, a small GPS receiver-sized thigh pocket and two zipped OS map-sized hip pockets. The Fjällräven Abisko/Nikka is a great choice, but the price seems a bit steep for what you’re getting by comparison. 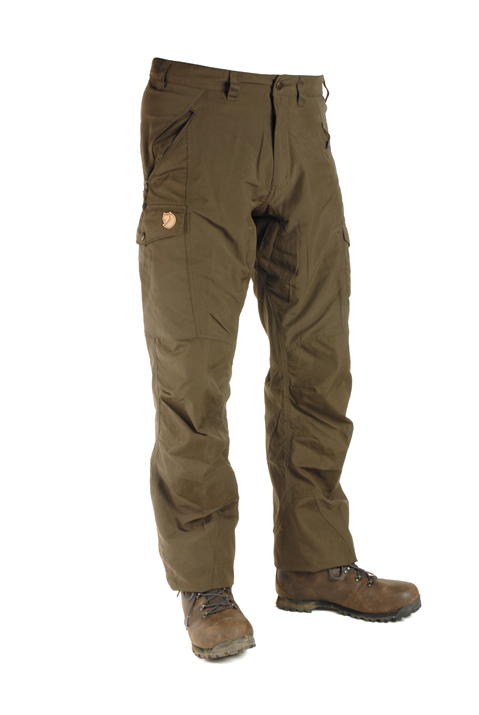 A high price, but Fjällräven’s Abisko/Nikka trousers offer a unique mix of features and they are well-suited to valley, moor, hill and mountain walking as well as backpacking activities.